On 28th January, Professor Adrian Cheok launched a mobile gadget which emits food flavours at the world-renowned Madrid Fusion culinary festival. Professor Adrian Cheok has launched a revolutionary new device. 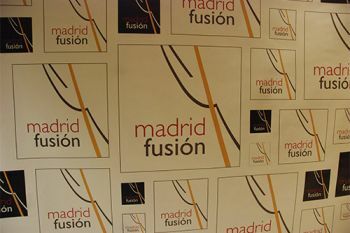 On 28th January, the City University London Professor of Pervasive Computing joined Michelin starred chef, Andoni Luiz Aduriz and President of "El Jardín de Junio", Dr Luis Castellanos, at Spain's Madrid Fusion to unveil Scentee, a new digital mobile phone app and device. The digital app is attached to an Apple iPhone to permit the user to virtually prepare a recipe from the restaurant using gestures. The aroma from the finished dish is then released from the phone. While in Madrid, Professor Cheok and the Scentee app received extensive media coverage. 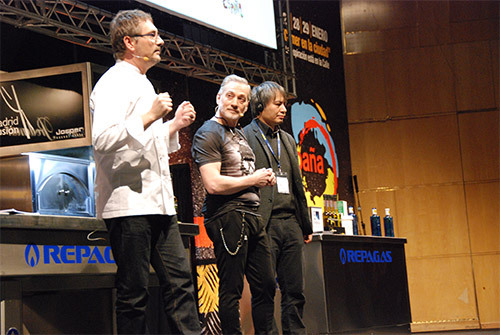 A production team from BBC technology show, Click, flew to Spain to film the launch of the app. "In the Internet age, chefs will no longer be solely in their kitchens. They will be like composers and producers on a global scale". The app is also expected trigger new innovations and industries for digital and internet communication, entertainment, office automation, and health therapy, using digitized mobile smell. City researchers have been spearheading new methodological approaches for digitally stimulating the sense of taste to enable remote communication through the sense of taste and smell. They aim to obtain a controllable and accurate actuation of taste and smell using digital methods for the benefit of industry and academic research and to improve the lives persons with smell and taste disabilities. The research will also improve the everyday lives of people wanting to further enhance their social networks with the addition of these modalities. In November 2013, Professor Cheok and his research team were presented with the title of Honorary Experts for their participation as finalists in the Telefonica Hacking Bullipedia competition.